What is the healthy water ? Healthy water means water that is not only safe but it also has Mild Alkaline, Antioxidant, Anti Inflammatory. Healthy water means water that is not only safe but it also has Mild Alkaline, Antioxidant, Anti Inflammatory, Anti Ageing, Anti Cancer, Anti Alcoholic, Anti Obesity, better hydrating and better detoxifying properties. This healthy water improves body’s immune system to fight against any health disorder from common Cold to critical Cancer. Your drinking water may be “SAFE” today. But it doesn’t matches “SAFE AND HEALTHY H-Rich WATER”. How does Water Ionizer makes Healthy water? 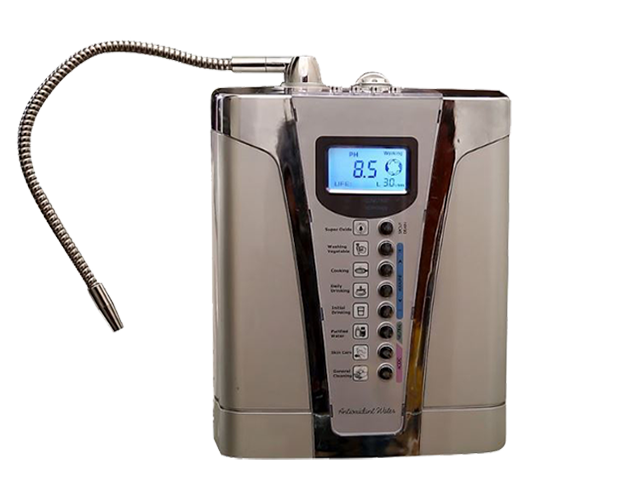 Water Ionizer makes Healthy Water beneficial to human in long term through a process called Electrolysis. It is run in a state of art electrolysis chamber which contains electrodes made with quality precious metals-Titanium coated with pure Platinum on both sides. This imparts the below properties to normal water. 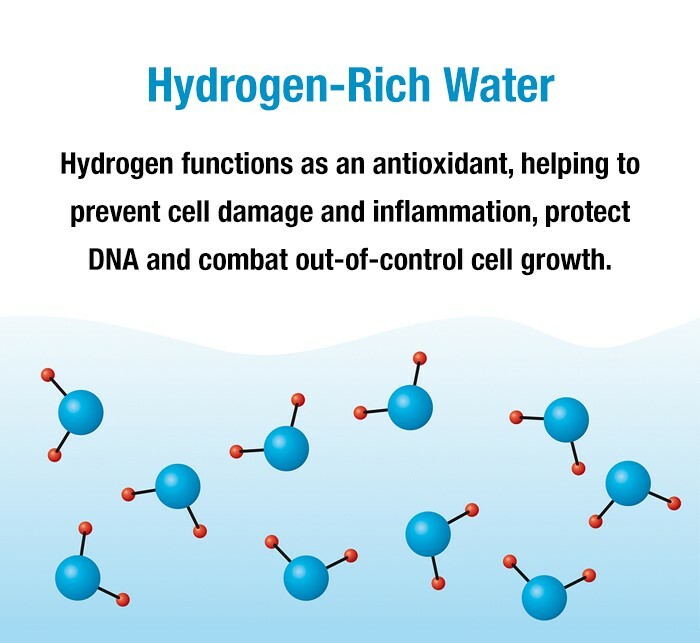 Molecular hydrogen has been scientifically proven to have antioxidant properties that help to remove free radicals from your body that cause premature aging of your skin. pH(Potential of Hydrogen) normal range is between 1 to 14, pH 7 is taken as neutral. Any substance or liquid with pH above 7 is called Alkaline, and pH below 7 is called acidic. Our blood pH is 7.35 to 7.45, so alkaline. 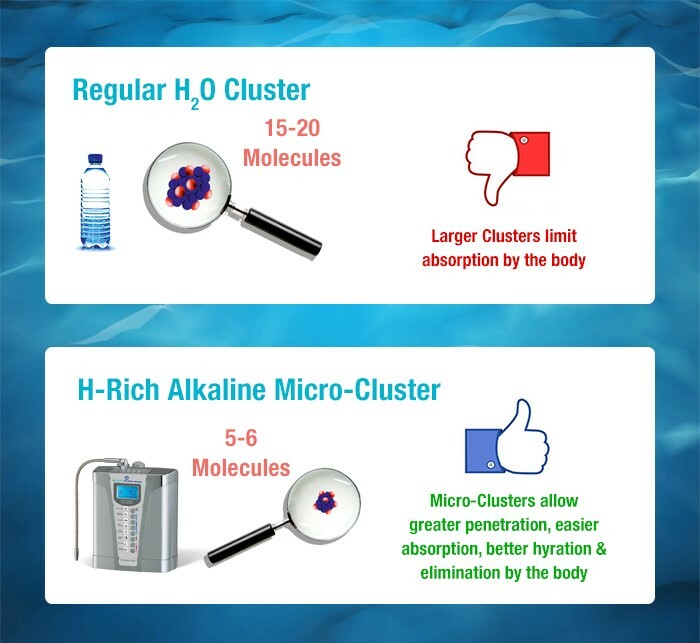 So H-rich Water Ionizer gives you healthy water with the properties of alkalinity, antioxidant nature, detoxification, hydration, and Pesticide cleaning. When water is Micro-Clustered it ensures more energy proper supply of Oxygen, Vitamins and Nutrients to vital organs with more absorption and penetration into the body cells. 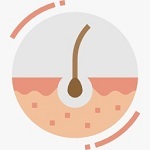 Micro-Clustered Water also collects impurities and wastes and flushes out resulting in highest level of detoxification. Hydrogen is a powerful antioxidant and can counteract free radicals and therefore might help in the fight against cancer. 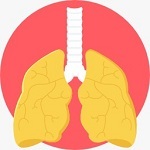 Although hydrogen can be administered by inhalation, it is much simpler and more convenient to take into the body orally through Hydrogen–Rich Water. Adding more hydrogen to water increases energy improves recovery after a workout and , making regular water look like a downright underachiever. In an experiment with young athletes, drinking hydrogen water reduced lactic acid build-up during heavy exercise and decreased muscle fatigue. 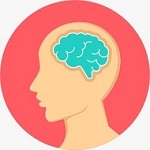 Because of the hydrogen present in the H-Rich water which increases the adult neurogenesis, this may be used for improving depression and some mental disorders. Bathing in hydrogen water for 3 months significantly improved wrinkles in the skin in a human study. 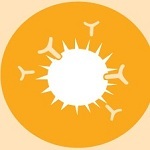 It also helps to reduce the human skin cell damage from Ultraviolet (UV) rays. Hydrogen water can significantly reduce the fatty liver with type 2 diabetes and obesity as well as with a high–fat-diet-induced fatty liver. Molecular hydrogen (H2) can protect cells and tissues from oxidative damage by selectively reducing reactive oxygen species (ROS). It also reduces oxidative stress and prevents cognitive impairment associated with dementia and Parkinson’s disease. Which Alkaline Water to Choose? The main purpose of Alkaline Water Ionizer is Healthy water. If a water Ionizer makes more Active Hydrogen at higher pH like 10-11 pH, this will not influence health benefits as we don’t drink this water. Advanced MLRD 4th Generation Technology patented flexible disk electrode design enable H-Rich Ionizers to make more concentration of active H2 at drinking levels. This (8.5,9,9.5 pH ) makes H-Rich alkaline water healthy than from other brands. It is suitable for family of all size and it can make different types of household waters like, drinking water, cleaning water, water to make coffee, tea and soups, water to cook food, strong alkaline water to soak vegetables and fruits to remove rain resistant oil fertilizer contamination and insecticides, neutral water for baby care, beauty water and strong disinfectant water with best germ killing power. Manufactured by Yi-Shan which is a very experienced company (Since 1981) and machines are sold all over the world. Works on 4th Generation MLRD membrane less round disc technology which controls electrode scaling and calcification to great extent. Special electrode gives the power to infuse high dissolved “Active Hydrogen Concentration” than conventional plate technology ionizer. Uses Optimum power to ensure best ionization along with industry standard pH, Orp micro clustering. Less wattage of power ensures less burden and longer durability to electrode. Both the Yi Shan the manufacturer and the authorised trader in India Medilight Health Care are certified by ISO and CE. Door step service and support for problems inside the machine during the warranty period in very quick time with the help of pan India dealer coverage. 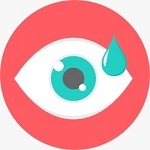 Want to see the Product Live? 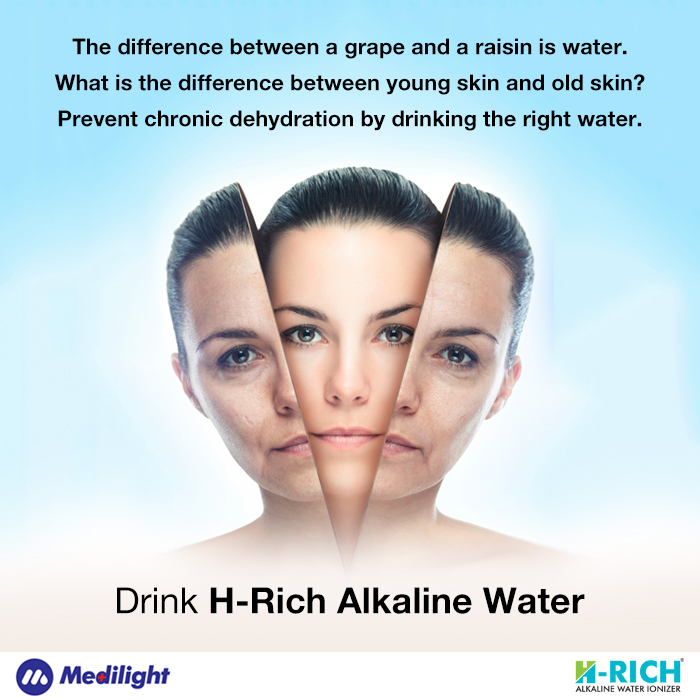 Due to the strong anti-oxidant nature of Hydrogen in H-Rich alkaline water, it will neutralize the free radicals and may help in preventing the following diseases. 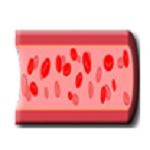 Cardiac Fibrosis, Hypertension, Ischemia and Myocardial infarction. Chronic Inflammations, Auto-Immune, Lupus, Ms, and Cancer. Are we drinking Healthy living water (water with life)? pH (potential of hydrogen) is a numeric scale used to specify the acidity or basicity of an aqueous solution. Its normal range is between 1 to 14, pH 7 is taken as neutral. Any substance or liquid with pH above 7 is called alkaline, and pH below 7 is called acidic. Our blood PH is 7.35 to 7.45, so alkaline. Similarly, in the pregnant woman, the fluid surrounding the developing baby is alkaline with pH between 7.5 to 8.0. 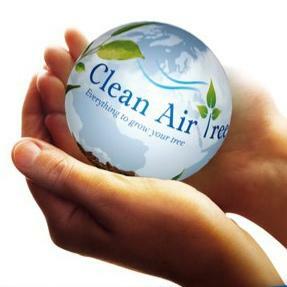 H-Rich alkaline water can be used to clear the pesticides on vegetables and fruits. Normal water can’t able to remove these oil-based pesticides as the High alkaline water. 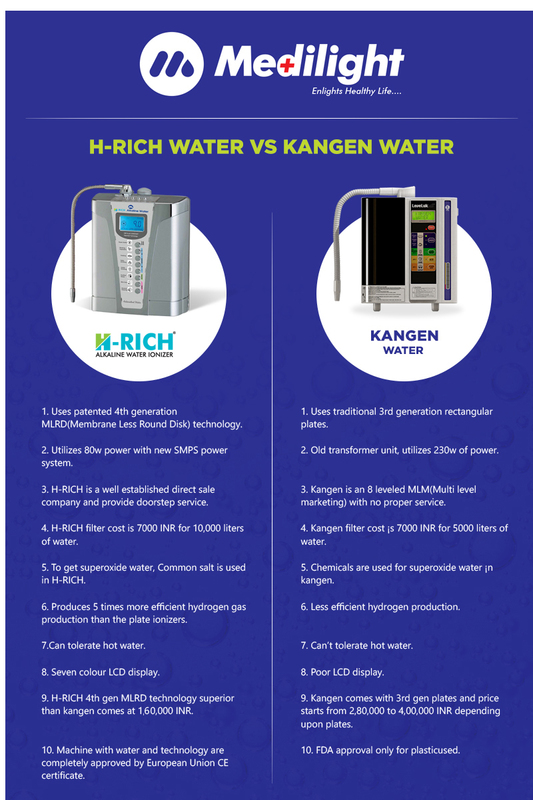 So H-rich water ionizer gives you healthy water with the properties of alkalinity, antioxidant nature, detoxification, hydration, and Pesticide cleaning. Health is more important than wealth, so start your day with a glass of Healthy water. We need to understand the fact “if our life depends on water, health also depends on the water we drink”. Water plays an important role in our body, it constitutes 70 to 80% of our body weight. Water keeps our body cells in good hydration and removes toxins from our body. RO water (Dead water) has been just clean, but not healthy; it is just free from germs and dust. Healthy water is not only clean but gives healthy properties like Alkalinity, Antioxidant nature, good Hydration & Detoxification. 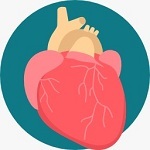 Our body is undergoing oxidative stress daily due to free radicals generated from the pollution in our environment; this is responsible for the diseases like diabetes, high blood pressure, high blood cholesterol, heart attack, paralysis, arthritis, acidity, kidney and liver diseases etc. To combat this we require strong antioxidants in our food. Doctors advise us to take more vegetables and fruits daily, the reason behind it is most of the vegetables and green leaves are alkaline with a pH between 8 to 10 and fruits are rich in antioxidant Vitamin C. Hydrogen gas is a better and stronger antioxidant than Vitamin C as evidenced by more than 12 years of research by Japan scientists and doctors. 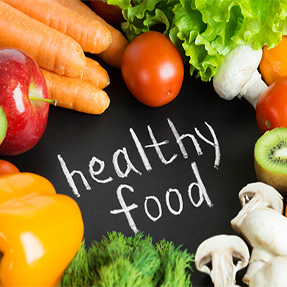 To combat the oxidative stress generated from increased pollution in the environment, we require a daily intake of good amount of fruits and vegetables. But as it is impossible to take such good amount of fruits and vegetables, we came up with a very good solution. 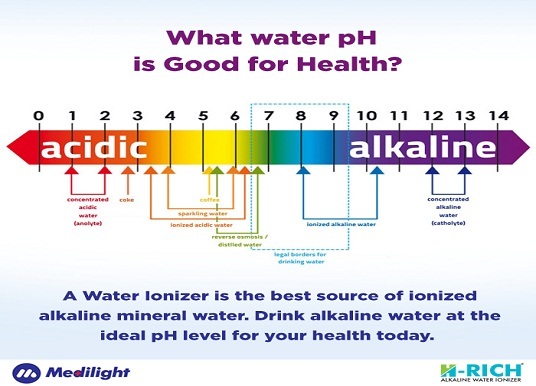 The solution is our “H Rich” Alkaline water ionizer; it provides alkaline hydrogen-rich antioxidant water. Not only alkalinity and antioxidant nature, this water also has detox nature as it can easily remove all toxins from our body 20 times better than normal water. This is possible due to the small microclusters of water, which can penetrate our body cells 20 times better than normal water. Rich in negative Hydrogen ions (H-) and active Hydrogen (H). 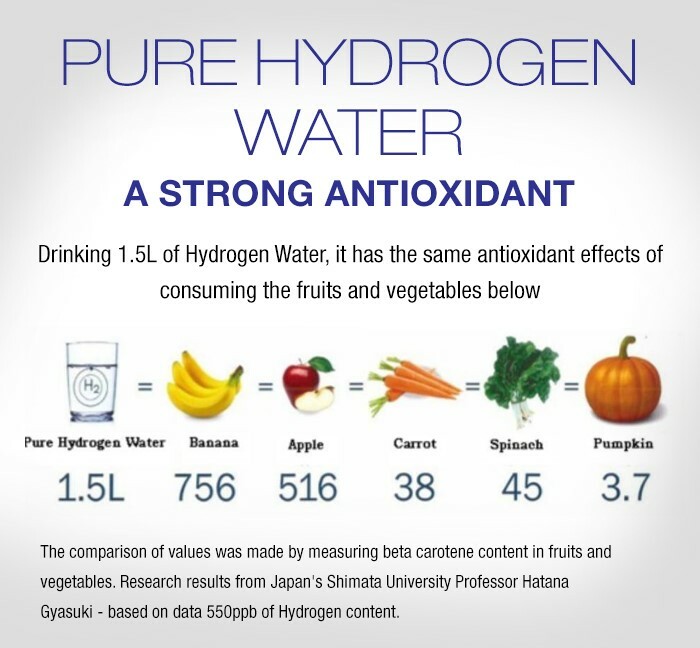 Hydrogen is the smallest and most powerful natural antioxidant in the universe, also in our human bodies. Ionic Alkaline water with effective & safe pH of 8.5-9.0 helps to restore the proper pH balance in human bodies. Rich in electrons (e-) or negative ions, with super antioxidant action. Rich in natural ionic alkaline minerals such as Ca2+、Mg2+、K+ etc. 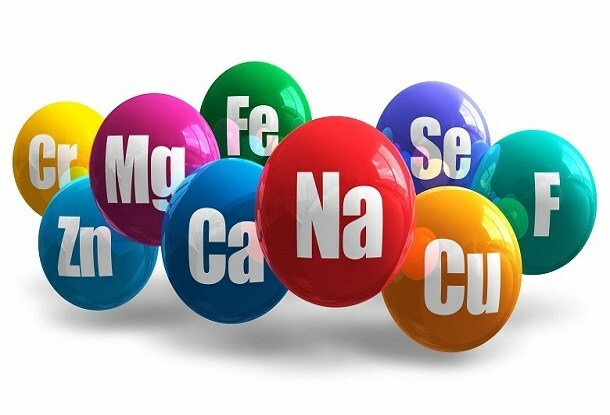 These ionic minerals are readily absorbed and Utilized by cells. Rich in dissolved oxygen, the fuel of metabolism. Natural Hexagonal structured small cluster water serves as the best carrier. The number of persons in a household: 5 family members (2 adults & 3 kids) Estimated water intake for each person: 8 glasses of water a day The price of H-Rich Alkaline Water Ionizer is INR 1,67,000 per unit. Here are a few frequently asked questions which our customers usually have. What is difference between simple alkaline water and H-Rich alkaline water? Simple alkaline water is just above pH 7.0. There are no proven studies about this water in particular. The only benefit with this water is short-term relief from gastric acidity in the stomach. 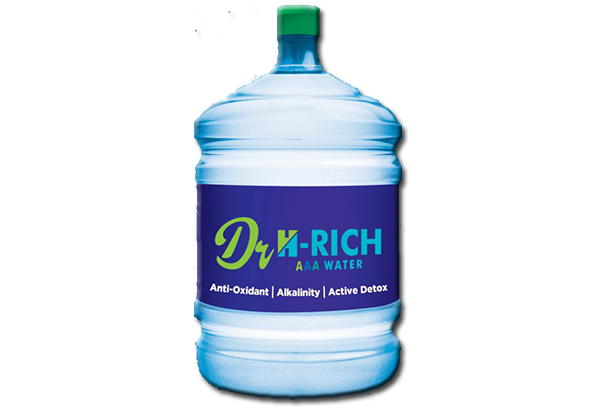 H-Rich alkaline water is a special water drawn from special water ionizer built on advanced 4th generation MLRD Technology. The water is a combination of both alkaline (influencing 5-10% benefits) and Hydrogen Rich Nature (influencing 90% benefits) which helps in all round long-term health benefits. What is this Ionized water? The water ionizer is a device which works on the principle of electrolysis, which we learned it during our high school days in chemistry subject. The electrolysis is nothing but the splitting of your normal tap water into two parts the alkaline ionized water and acid ionized water which comes out through two separate outlets from the machine. This process of Ionization splits the large water molecules into very small hexagonal water molecules which can easily penetrate each body cell 20 times better than the normal tap water and RO water. Ionized water okay, What is this Alkaline ionized water? According to the Ph scale ( potential of hydrogen), the value lies between 1 to 14. The Ph scale tells you whether the substance is acidic or alkaline. Substance with value less than 7 is called acidic, more than 7 is an alkaline substance. Is it safe to take alklaine ionized water? 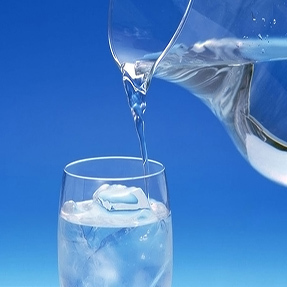 Alkaline water consists of calcium and magnesium which are important for our body metabolism.. In an extremely positive way! Numerous athletes have reported increased stamina and endurance from drinking the water because of the abundance of oxygen and a smaller cluster size of the water molecule. When professional and amateur athletes discover Ionized Water, it usually becomes one of the most established benefits to them. .
Hydrogen Rich Alkaline Water Reduces Side Effects of Cancer Treatments? 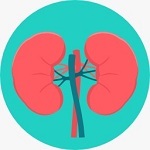 Drinking hydrogen water can improve mortality and body weight loss caused by an anti-cancer drug and also reduces kidney toxicity. 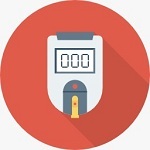 How is the Disk ionizer better than the Plate Ionizer? There is no question of superior or inferior technology. Any marketer will say his technology is the best. We say our 4th generation technology is more useful the plate technology for two reasons. – As there is no exchange membrane in a disc electrode, this reduces the scaling and calcification to the maximum extent. As no frequent manual cleaning is required, it ensures long durability to the electrode. More clean electrode ensures a constant level of ionization without ups and down. More clean electrode and more level of ionization mean more active hydrogen derivation. Want to Become Our Distributor and Earn? Here we offer several ways to make money working with us, while offering an outstanding product that will help your customers and families. And because we are not an MLM company we offer great value to your customers and great profit for you. We offer great support and training and marketing materials to get you up and running quickly. 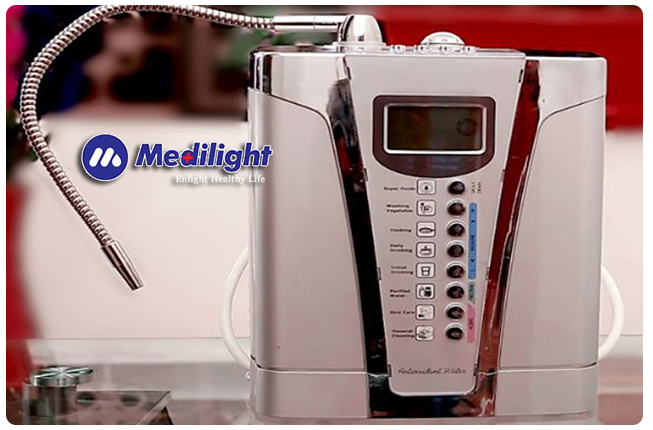 Cutting edge design, features and technology, including the most advanced water ionizer. We offer outstanding products, outstanding profit, outstanding customer service and outstanding marketing materials so you do not need to take tension of it. Each ionizer comes with an excellent installation, use, and maintenance DVD so you do not waste time figuring out everything yourself. 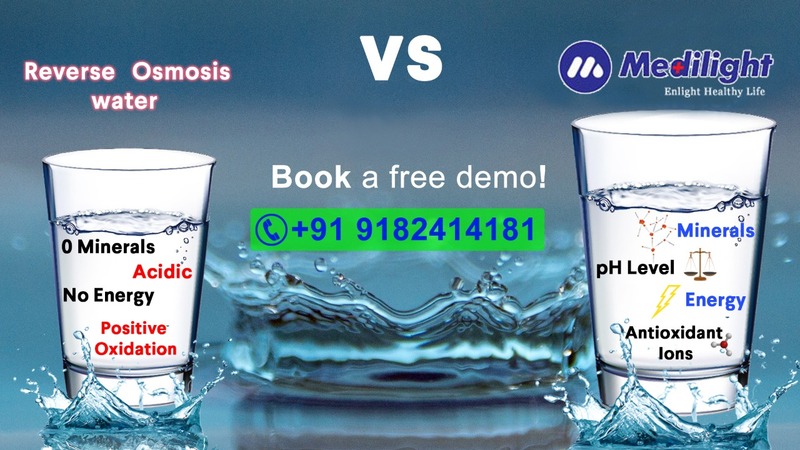 After 6 months of extensive research, Dr. H-rich has come up with India’s first Commercial Water Ionizer for all the common people who are a bit optimistic about buying the H-rich water ionizer machine due to its cost factor.